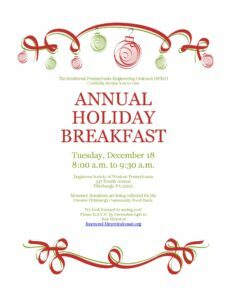 Tuesday, December 18th, 8 – 9:30 a.m.
Monetary donations will be collected for the Greater Pittsburgh Food Bank. Up to 4 persons from each member firm can attend. In the Spirit of Giving, please bring your Cash / Check donation made out to the Greater Pittsburgh Community Food Bank so we can help our neighbors overcome food insecurity. Please RSVP by December 14th to Ray Meyer at raymond.meyer@alcosan.org.